All type of server memory available. Keeping in mind ever-evolving requirements of our respected clients, we are trading highly reliable SUN 2GB Server Memory. - Gold plating on PCB gold finger is 30 u"
In order to keep pace with never ending demands of the customers, our company is instrumental in offering DRAM Memory Module (DDR3-1333 1.35V). 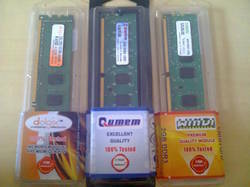 We are the leading supplier and trader of Server Memory Module.